Landscape painting in the Americas is shockingly poorly covered in books, compared with that in Europe. This is despite the wealth of extremely talented and highly productive artists in many of the countries of both North and South America. This ambitious book, a catalogue for the exhibition of the same name (see below), intends to help redress the balance. The aim of the book, and exhibition, is to bring together the visual histories of the “magnificent visions of key sites” during the nineteenth century formative period of exploration and colonisation, and the issues at play in the conception and representation of land itself, which took place during the nineteenth and early twentieth centuries. By examining the genre of landscape painting in the Americas over this period, the editors (and project leaders) hope to broaden the understanding of landscape painting across the Americas as a whole. Each of the book’s six chapters consists of an introductory overview, a couple of short themed essays, and several detailed accounts of works included in the exhibition. As none of these is longer than about eight pages, the book is made up from 55 sections, each written by a different author. The first chapter, Land Icon Nation, considers some of the responses of the early settlers to the terrain and landscapes as they were discovered in the Americas. Locations featured include Mount Chimborazo (Ecuador), the Niagara and Montmorency Falls, the Valley of Mexico, and the early development of Rio de Janeiro. These are examined through a series of highly realist paintings from the nineteenth century, of which the best known are by Albert Bierstadt and Frederic E Church. 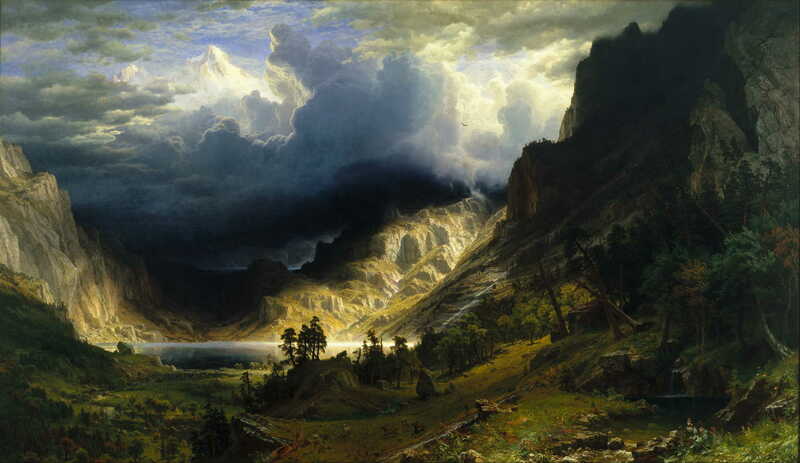 Albert Bierstadt, A Storm in the Rocky Mountains, Mt. Rosalie (1866), oil on canvas, 210.8 x 361.3 cm, Brooklyn Museum, New York, NY. Wikimedia Commons. The second chapter, Field to Studio, examines the role of realist paintings, drawings and lithographs from the nineteenth century in documenting the new lands, terrains, and environments, as a development from the previous chapter. It shares some locations, and adds more including various forested sites and views of ‘the interior’ of the continent. There is a wonderful essay on Frederic E Church by Jennifer Raab, which bodes well for her forthcoming book on the painter, and a brief look at a couple of paintings by Thomas Moran. Additional sections consider more ethnographic views which depict indigenous peoples. Land Encounter Territory, the third chapter, develops this last theme further, looking at the conflicts which arose between the indigenous peoples and the colonisers. 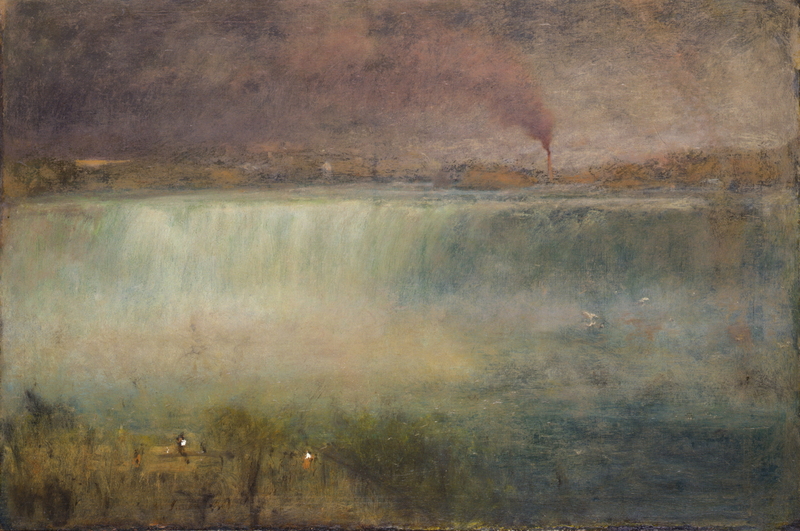 Its star essay, by Anna Hudson, details the Red River Expedition to Kakabeka Falls of 1870, and its conflict with the indigenous Métis, as revealed in a remarkable series of paintings by Frances Anne Hopkins. Other sections look at paintings of the Paraguayan War, and several works depicting indigenous peoples. 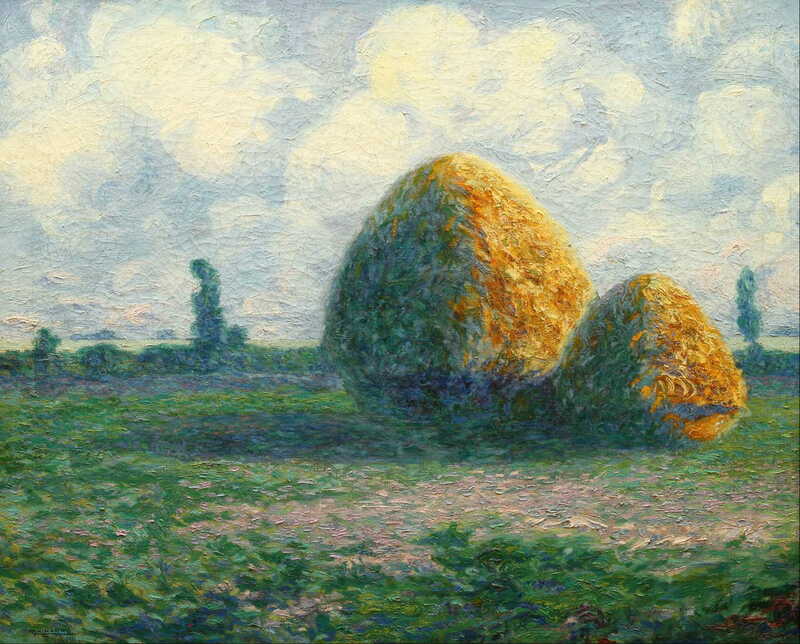 The fourth chapter, Land as Resource, focusses on paintings which show how man started to exploit the land for its natural resources, particularly agriculture. Its centrepiece is Edward J Sullivan’s review of paintings and prints showing plantations in the Caribbean, notably those of the Puerto Rican artist Francisco Oller. There is also a brief glimpse into George Inness and his influence by Swedenborg, although the painting chosen – Summer Evening, Montclair, New Jersey (1892) – would not have been in my shortlist for exhibition. The fifth chapter, Land Transformed, takes the influence of man a step further, to the growth of urban landscapes in the latter nineteenth century. Laura M Costa’s introductory essay is the first to consider the changes taking place in painting during this period, and she illustrates this with Martin Malharro’s The Large Pampa (1908), and Pio Collivadino’s Train Smoke or Moving Machines (1910), showing influence from Monet’s paintings of the Gare Saint-Lazare. John O’Brian’s essay on Charles Sheeler and his ‘Fordscapes’ of US industrial landscapes is another notably successful section in this chapter, bringing it up to the 1930s. I also enjoyed Regina Teixeira de Barros’ look at the Brazilian artist Tarsila do Amaral’s paintings from the 1920s, and there are single works from the influential James Wilson Morrice, Grant Wood, Tom Thomson, and Juan O’Gorman to reach the 1940s. The final chapter, Icon Nation Self, rounds the book off by considering the awakening of a new “autonomous consciousness” in landscape artists of the Americas during the twentieth century. This gives opportunity for further paintings by Tarsila do Amaral, and a smattering of works by Rockwell Kent, Emily Carr, Georgia O’Keeffe, and ‘Dr. Atl’ (Gerardo Murillo). Essays are on more recent painting of the pampa (by Gabriel P Linari), and Lawren S Harris (Sara Angel). End matter includes an extensive and valuable list of further reading, and a single index which includes locations, artists and their works, and topics. Although I would have preferred the latter to have been separated into three indexes, it actually works well. As there is no separate list of works included in the exhibition, and this is not indicated in the captions either, we are left to guess which we would see if we were to visit. The exhibition includes over 100 works in all, but this book illustrates over 200. Another very minor quirk is that the book’s figures are numbered not in an overall sequence, but separately in each section, resulting in many being labelled as Fig. 1. Other illustrations have slipped the numbering process altogether. It would have been so easy for the 55 different contributions to have left the reader dazzled, dazed and confused. However, expert editorial work has brought them together like jewelled tesserae in a mosaic. As you progress through the book, its themes and threads weave through the different sections and chapters, so that by the end it does achieve its very ambitious aims. However it is primarily a catalogue, and is not a systematic survey. 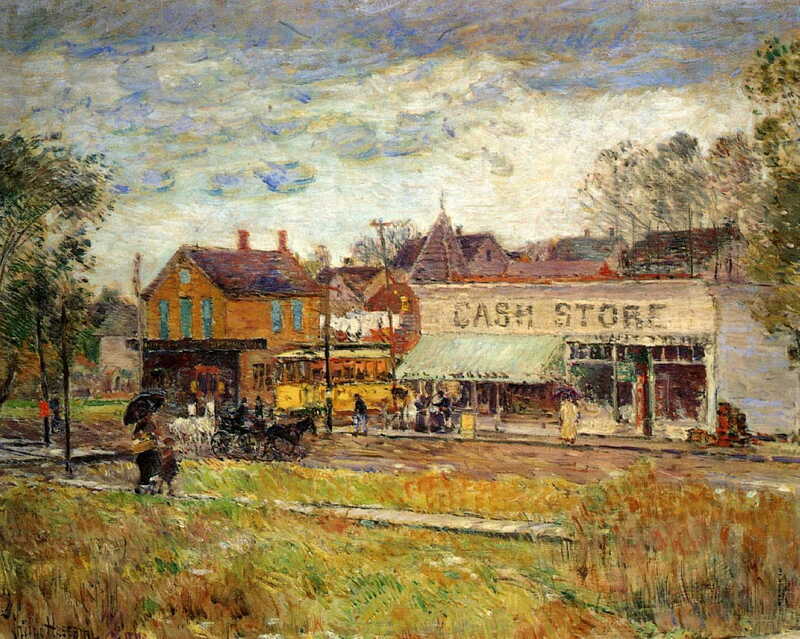 Frederick Childe Hassam, End of the Trolley Line, Oak Park, Illinois (c 1893), oil on canvas, 44.5 x 55.25 cm, Private collection. WikiArt. Its most significant omission must be in coverage of the North and South American Impressionists, which Laura M Costa’s introduction to Chapter 5 gives only the tiniest and most tantalising glimpse. Sadly there is no mention at all of William Merritt Chase, Childe Hassam, Robinson, Twachtman, or Weir, nor of their development of urban landscapes to parallel those of the European Impressionists. It would also have been very desirable to have seen some of the Impressionist paintings from South America, which remain inaccessible to much of the rest of the world. Hopefully we will get to see those another time. 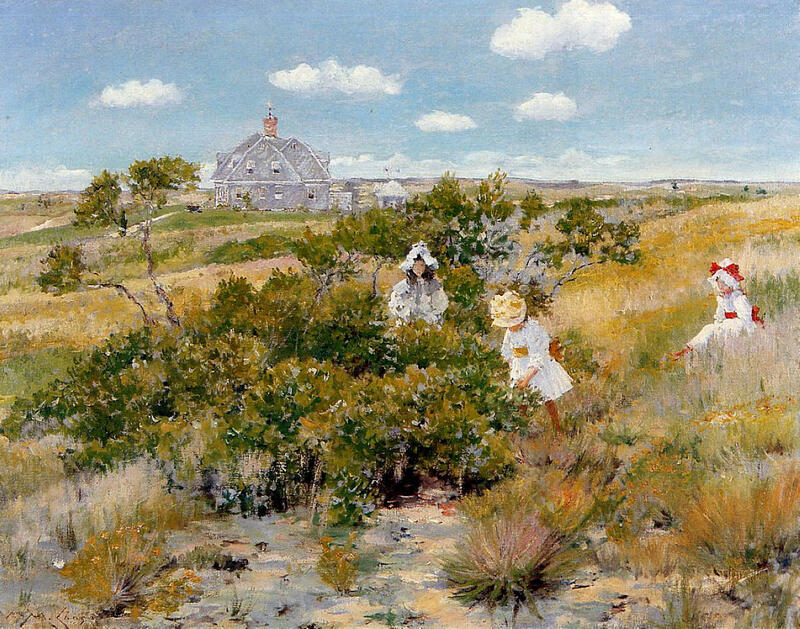 William Merritt Chase, The Big Bayberry Bush (c 1895), oil on canvas, 64.77 x 84.14 cm, Parrish Art Museum, Water Mill, NY. WikiArt. There are some slightly odd errors which have crept into parts of this book. 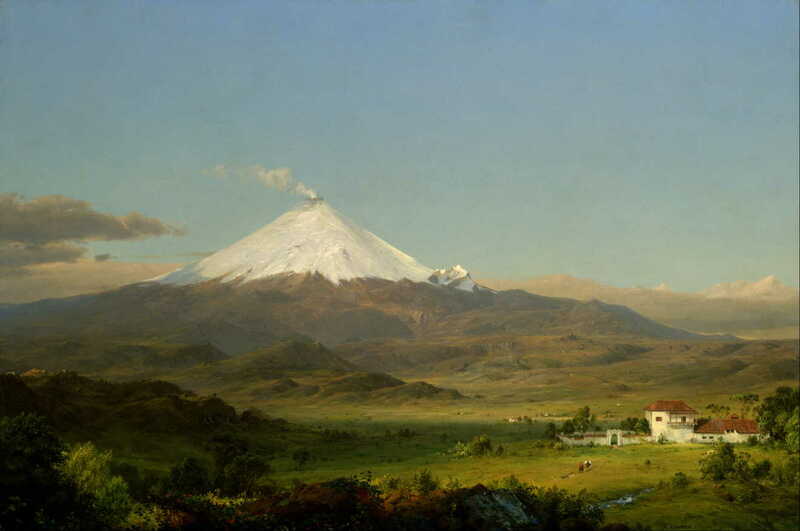 For example, Katherine Manthorne’s early overview Land Icon Nation states that in 1822, Mount Chimborazo was “considered the highest peak on the globe” (p 19). Although this may have been true prior to the nineteenth century, Dhaulagiri was (correctly) believed to be higher from 1808 to 1838. My deepest regret about this book is its lack of locational aids. Unless you are very knowledgeable of the geography of both North and South America, you will need to read this next to your computer or atlas, so that you can identify the many different locations which it covers. It should not have been difficult to have had miniature maps to accompany each of the major works, and a short appendix collating all the locations on a larger map. Although thoroughly well-designed and produced, the font used has an exceptionally low ascender height for its lower case letter ‘t’, which makes it too similar to the letters ‘c’ and ‘r’, causing irritating misreadings quite frequently. Given that this book has no serious competition, it is inevitably the best in its field, and an essential purchase for anyone interested in the development of landscape painting in the Americas. It deserves a much wider readership too, and the exhibition merits your attendance. We are fortunate to be able to enjoy many fine books, and exhibitions, which seek to re-evaluate aspects of art history. This is different: it starts to document and analyse an essentially new field. If you are getting jaded by endlessly rewarmed Impressionists, or find further analyses of modernism growing increasingly tedious, this could be just what you need. Posted in General, Painting and tagged America, Bierstadt, book, Church, Inness, landscape, Malharro, painting, review. Bookmark the permalink.